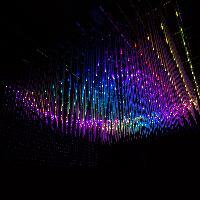 Now the largest stockist of SGM LT pixel tubes we can offer a new dimension to your events. Creating both ambient and impact effects the tubes and bobbles can be located in many different orientations to create bespoke designs showing customised content tailored to your event. Experiential and immersive installations and entrances are possible including light that reacts to your sound and movement. Creating divides between event areas and virtual backdrops through to unique club and dance environments are possible with this technology. Adding Point 30s to stock in addition to the Point 20 has allowed us to cater for a multitude of events this year from changing the colour of the ss Great Britain to lighting up trees down The Mall in London. Many weddings and garden parties from large to small have been illuminated without the need for a single wire. We have also provided Core lights to provide essential safety lighting at some events. The new Point 30 is IP rated for use outside and housed in a rugged aluminium casing where as the Point 20 is a clyindrical uplighter that can be fitted with many custom colour cases.